The New Year has arrived. The time for resolutions and reflections over the previous year. I looked back over the year before: I had accomplished many things, and failed at other things that I'd planned to accomplish. As I began to reflect, I couldn't help but think: This is NOT how I pictured my life at 32. I mean, here I was, a single mother, still in school, surrounded by questions of, "What are you planning to do once you finish school?" The truth is, I have absolutely NO idea. I just went $60,000 into debt to complete grad school, and I have NO IDEA what I want to do! The thought of it is quite embarrassing! But should it be? 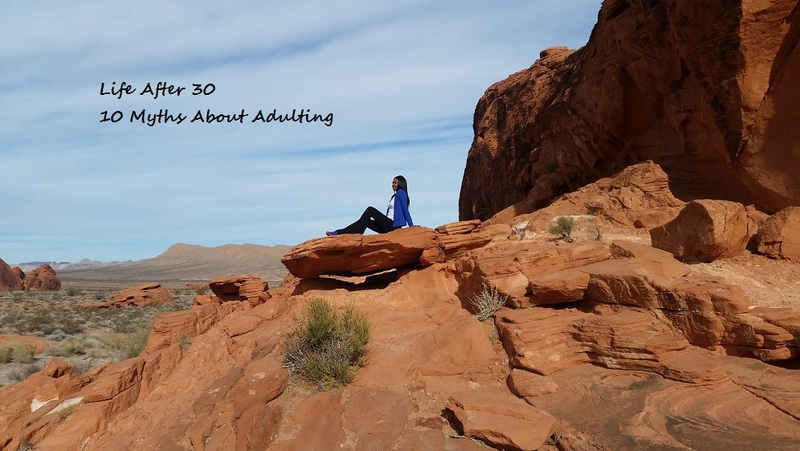 I began thinking, what does it mean to be an adult? We've crafted these images about how one should live their life as a responsible adult, but what if you can successfully adult without any of those things? You should work a 9-5 job that pays you 100K per year. Sounds about right, huh? The American dream! But what happens when the American dream doesn't match the dream that God placed in your heart? What if your dream requires that you work odd hours? What if your dream requires unpredictability? What if your dream *gasp* doesn't afford you the luxury of all of the latest trends and gadgets? Does that make you any less of a responsible adult? Heck no. Do what you love! You should buy a house. As a homeowner, I can tell you that home-ownership ain't all it's cracked up to be! Don't get me wrong, I LOVE my house, but between home repairs, lawn service, HOA fees, cable, water, light bills, gas bill, unexpected mishaps, new air filters (who knew you were supposed to replace those? ), and every other thing associated with home-ownership, I question the necessity of it all. And God forbid you have to move and sell your house. I say, if you want to rent for the rest of your life, gosh darn it, you rent! You should get married. I'm all for companionship, but what if I like living by myself? Does that make me a failure at adulting? What if I want to travel the world and live spontaneously from day to day then return home to my empty house? Is that so wrong? Absolutely not. People will try their best to force marriage down your throat. Do not be fooled, one does not need to be married. You should have children. I love my son to death. He's everything to me. But children.are.work. Why do people act like children are all fun and games? They change your life, and there's no turning back once they get here. Why, then, do people insist on shaming you into having a child (or more children once you have one). Have kids, they say... it will be fun, they say. If you don't want kids, don't have em, and feel no regrets. You will have no financial struggles. Things happen. Whether you're making 100K or 20K, there may come a time when finances are extremely tight. This is not a reflection on your ability to adult (unless of course, you squandered your bill money on the latest Iphone, then I may questions your adulting skills). But really, struggle is an inevitable part of life. You have to be independent. If we were made to be alone and do everything by ourselves, God would have stopped at Adam. Who said being an adult requires that you never ask anyone for help for anything? No favors, no assistance, nothing. Do it all on your own. That that shows how fantastic a person you are. Not. If you need help, ask for freakin' help! Don't struggle in silence. God lined people up in your life for a purpose. Maximize on them. You have to keep the same friends you grew up with. We have a tendency to hold on to people simply because we have known them all of our lives. That's wonderful if you two are still on the same path with the same values; but if you are trying to build a life, and they are turned up in the club every day, this may not be the person you need in your life. As much as it hurts, some people have to go. Life decisions become easier. This is just a flat out lie. Things get harder, your choices are way more important, and you have more at stake. Decisions are not easier. End of story. Everyone is doing better than you. First of all, don't worry about what it looks like everyone else is doing. Not to say that people lie (they do), but people show you what they want you to see. Just like you don't go share your fears, insecurities, and short-comings with the world - nobody else does either. That's why everyone else seems to be doing better. They aren't. You should have it all figured out. What if I told you that most of us DO NOT HAVE IT FIGURED OUT? My absolute FAVORITE meme of the moment says "'I'm gonna wing it' - Me, about something I most definitely should not wing." 9 times out of 10, I'm living life on hope and a prayer. I don't know what's next, but I know that God has things figured out for me, and He has things figured out for you too! Adult on your own terms.